After a very fast but wonderful summer interning in São Paulo, Brazil I am back in DC for my second year of graduate school at Georgetown. It was nice to return to ISH and campus as familiar places that I already knew I enjoy. It has been fun catching up with ISH friends, even those who now live elsewhere. 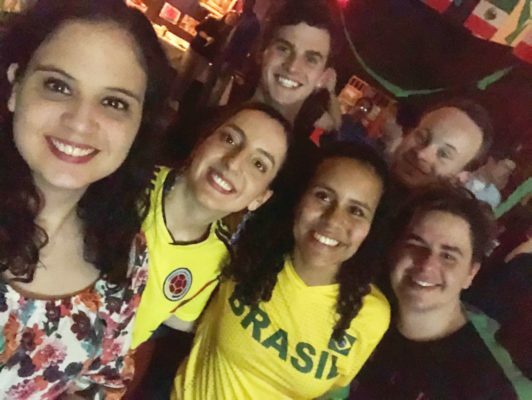 Soon after getting back in August, I reconnected with a Brazilian friend who used to live at ISH and a resident from the UK who lived at ISH last fall for a short time and recently came back. I was happy to introduce them to Ethiopian food for lunch one day as we caught up about our summers. The majority of faces at ISH now are new to me. My night class heavy schedule has prevented me from meeting people in the dining hall over meals, but there have been several fun events where I’ve gotten to know the new community. 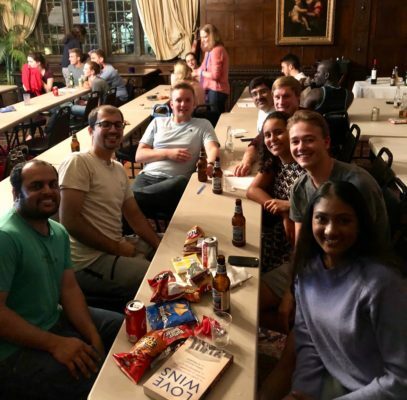 For example, the “9th Nonconsecutive Biannual International Student House Pub Quiz” was a great way to make new friends and brush up on random international trivia knowledge. My team had representatives from Pakistan, the UK, the Netherlands, Sri Lanka, India, Germany and the US. 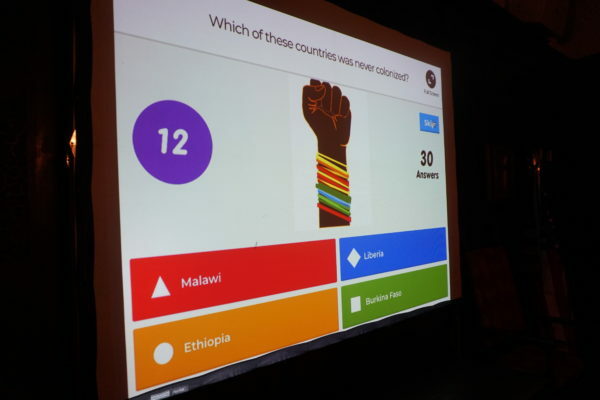 A current and former resident created and co-hosted the challenging and at times very random pub quiz. My personal favorite part was a worksheet task where we had to correctly identify and label pictures of current world leaders when they were teenagers. 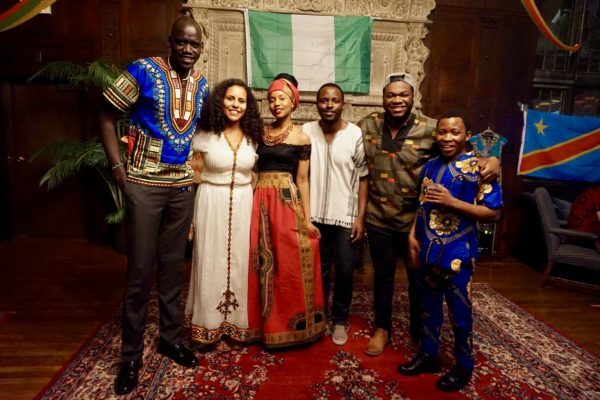 The next big event where I got to connect with the wider ISH community was the Alumni Hosted Cultural Cookout. It was a beautiful day to be outside and enjoy great food and good company. 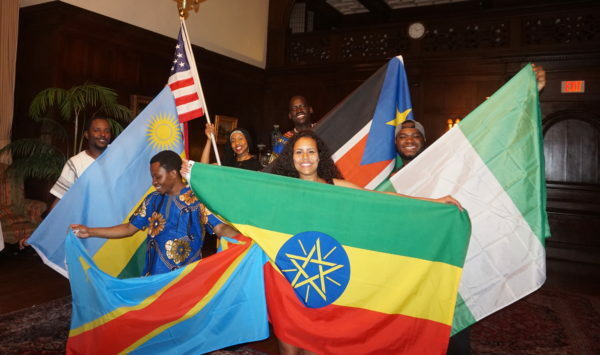 Alumni set up tables highlighting their home countries with food, beverages, music and art/cultural displays. 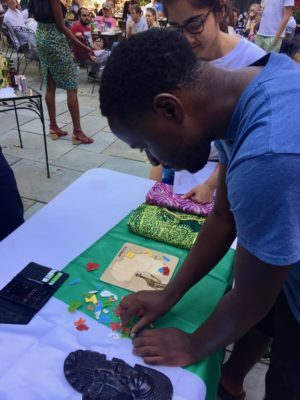 I enjoyed tasting French wines while speaking French, watching students put together an African continent map puzzle, tasting some familiar food, and chatting with an alumnus at the Serbia table about my experience visiting Belgrade. Talking with alumni and new residents who are fellow graduate students or young professionals reminded me of how grateful I am to be apart of the ISH network. I am especially excited about the high number of African students at ISH compared to last year, including an Ethiopian student! I look forward to continuing to get to know new and old ISHers in the months ahead and beyond. It has been an eventful month at ISH! Residents have been planning many cultural nights to share their country’s food, dance, fashion and traditions with the ISH community. First was Bollywood Night! Delicious Indian food and drinks were served in the Great Hall followed by lots of dancing. A projector was set up to show popular Bollywood music videos and residents from India taught us their moves. Japan Night was next. The Japanese residents decorated the Great hall beautifully with different “stations” or tables of activities. At one table I experienced a tradition Japanese tea ceremony with a sweet cake and bitter matcha tea. Another had Japanese games including Kendama, a game that involves trying to swing a ball connected by a string to a wooden stick into a cup. There was also a calligraphy station where I learned how to write my name in Japanese. The Japanese residents created a true or false trivia game that I learned a lot of fun facts from. For instance, did you know that many families in Japan make reservations at the fast food restaurant Kentucky Fried Chicken on Christmas Day? At the end of the night several residents performed a Japanese dance called the koi dance using glow-in-the-dark wands. The day after Japanese night my Master’s program at Georgetown had an International Student Night. Students cooked food from their cultural backgrounds and dressed in national outfits followed by a talent show. I wore my traditional Ethiopian dress and my roommate, Manuela wore a dirndl that she got while she was living in Germany. 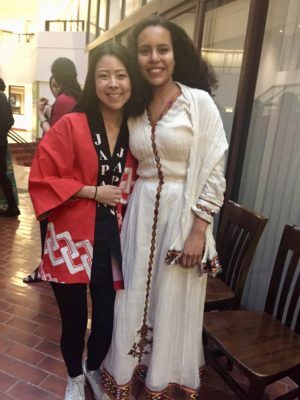 Here’s a photo of me and Karin, one of the organizers of Japan Night and a fellow Georgetown MSFS student. The final event of the month was Latin Night. Manuela, who is originally from Colombia, was part of the planning team along with residents from Brazil, Peru and Mexico. The Great Hall was decorated with pictures from beautiful places across Latin America as well as Colombian, Brazilian and Mexican flags. Music in Spanish and Portuguese kept things lively all night. The same morning as the event I got my Brazilian visa for the internship I will be doing at the U.S. consulate in Sao Paulo this summer. I wore a Brazilian jersey to the event and being at Latin Night got me even more excited to go to Brazil. I am happy to report that I am now involved in planning a cultural night. On April 28 myself and residents from Congo, Rwanda, Nigeria and South Sudan will be hosting an African Cultural Night! Several changes have come with the new year at ISH. Many residents moved out in December after completing semester study abroad programs or internships. While familiar faces remain, there are a lot of new additions to the ISH community. As introductory questions and conversation start up again between new and old residents interesting discoveries are made. 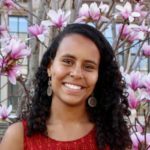 For some who recently moved in this isn’t their first time living at ISH DC others have lived at international student houses in other cities around the world. One of the first questions I tend to ask after the preliminary name, nationality and reason for being in DC is whether or not this is the first time someone has been to the United States. Responses range from people having completed their undergraduate in the U.S. to participating in an English immersion exchange program during high school to being first-timers. 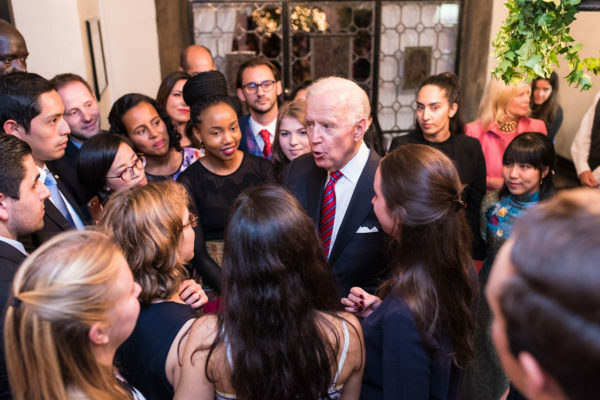 In addition to getting to know the new residents, January has been a month of many opportunities to share U.S. political culture. For example, one of our Sunday dinners was soul food themed in honor of Martin Luther King Jr. day. There was also an ISH game night, which involved a variety of well known board games and card games. 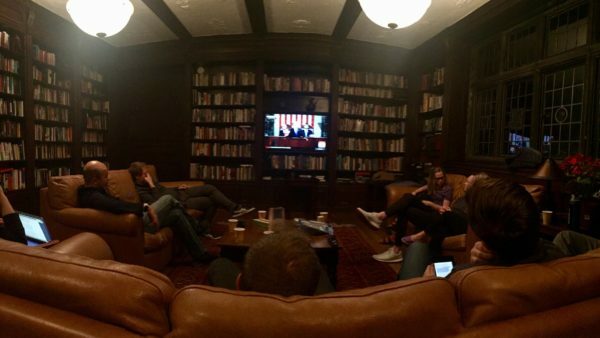 Several weeks later on the night of the state of the union address, several of us gathered in the TV room to watch the speech. Experiencing these historical, political moments with international company is a unique experience as an American. Talking about U.S. politics in a house with so many people interested in foreign affairs and global politics never fails to be interesting. One of the new residents decided to take advantage of the chatty, internationally minded nature of the ISH community by starting a new discussion group. Once a week a group of us will be meeting to discuss articles on issues of global importance. The first article is Susan Sontag’s “Regarding the Torture of Others”. The new readings series in addition to our weekly “salons” (a similar venue for talking about global affairs and culture) continue to make ISH an intellectually stimulating place to call home. Going into my third month living at ISH, I now feel more apart of the community than ever. A really memorable event that solidified this feeling was the Global Leadership Awards Dinner (GLAD). 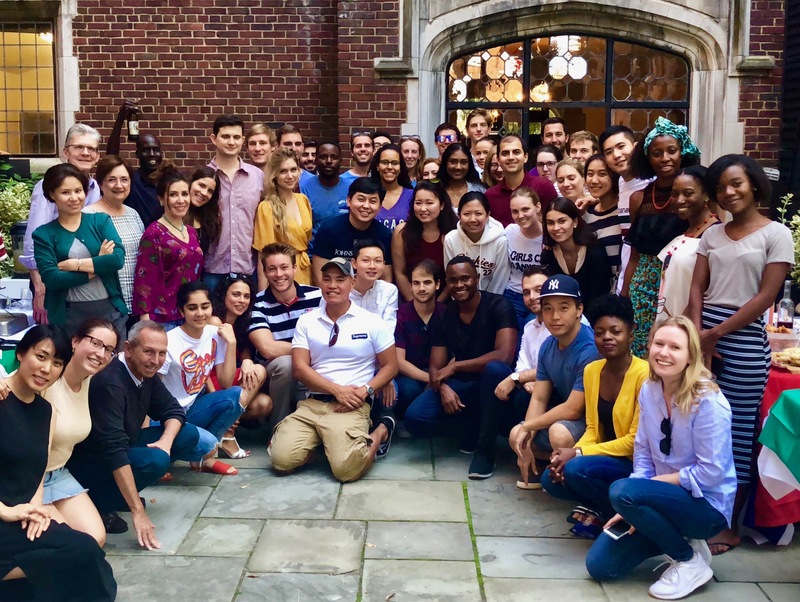 It was a special occasion for my fellow residents and I to act as hosts to highly regarded political figures and guests from across the globe who came to support the International Student House. The evening consisted of a lovely reception followed by a dinner in the garden. It was wonderful to see how much people care about international students and cross-cultural exchanges in Washington. The highlight of the evening was witnessing former Vice President Joe Biden receive the Global Leadership Award. The address he gave after being honored for the award was inspiring and encouraging. His humor and kind hearted demeanor was something I’ll never forget. After he spoke in front of all of the dinner guests he stepped away to take a photo with the group of residents in attendance. Before he left, he gave us a pep talk about the future of international affairs and our important role in it. It was a night I will always remember. Several weeks after GLAD, classes ramped up in the lead up to midterm exams. Although a challenging time, it was reassuring to experience the solidarity of residents from all different schools going through a similar experience. Papers, exams and projects had many of us up later than usual but it was really nice to regroup at breakfast or dinner and encouraging each other until we made it through. 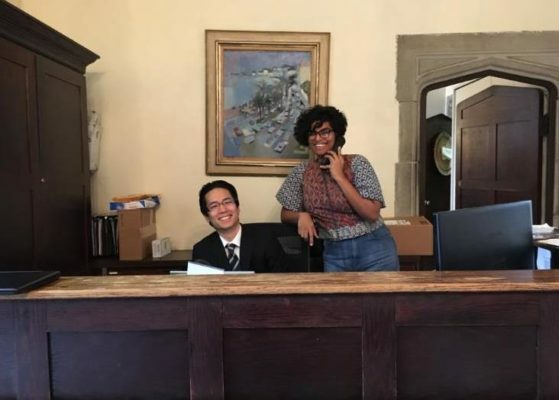 My housemates Meghna and Hayato also work at the front desk. At the start of October I took on a new role at the ISH front desk. Working at the desk has been a way for me to talk to residents I hadn’t met yet and get to know ISH administrators and staff. The desk is located in the lobby of the house so I get to see people come and go and learn more about the day-to-day happenings of ISH. All residents pick up packages at the desk which has been a great way to reinforce people’s names and where they’re from. During one of my shifts I got to welcome a new resident moving in from Japan. Because of each resident’s unique timeline in DC residents are always coming and leaving. The transitory nature of the ISH makes it all the more friendly and open as we wish people well as they head off to their next destination and welcome new additions to the community.